Why are Today's Chickens Bigger? 09 Feb Why do chickens today appear to be supersized, compared to previous years? Chickens today are in fact bigger and grow faster! As the demand for chicken as a protein has increased, especially chicken parts like breasts or thighs versus whole birds, farmers have worked to create larger and healthier chickens to meet that demand. In the 1920’s, the average chicken at market weight was 2.5 pounds and the U.S. population to feed was 115 million. Through a number of improvements in breeding, nutrition, veterinary care and bird health, today’s chicken farmers are able to raise bigger and healthier birds faster – an average of about 6 pounds at market weight today, to feed the current U.S. population of approximately 320 million. Added hormones or steroids. No chicken you buy contains added hormones or steroids, regardless of whether or not this is called out on the label. In fact, the use of hormones has been expressly forbidden by U.S. Food & Drug Administration (FDA) law since the late 1950s. Genetic engineering. No commercially available chickens are genetically modified, not for any purpose. Once the chicken moves to processing, we continue to look for indications of health. All poultry meat is carefully inspected for quality, signs of disease, limb and leg problems and bruising – all good indicators of the bird’s health before it was processed. Chicken meat that does not pass this inspection is removed from the food supply. Even as chickens have increased in size, there has been major decline in the amount of poultry meat that has been rejected during this phase of inspection (the technical term for which is “condemnation”) – showing that bird health has been consistently improving over time. Another good measure showing improvements in bird health is the fact that today’s chickens are able to gain weight quicker, which means less natural resources are used and less waste is created in the process. Compared to 25 years ago, chickens now require seven percent less feed per pound to grow. All of these improvements have led to chickens’ on-farm mortality rates dropping 450 percent, compared to only several decades ago. That’s a number we’re proud of, but we also know there’s still work to do to continue improving how we care for our birds. 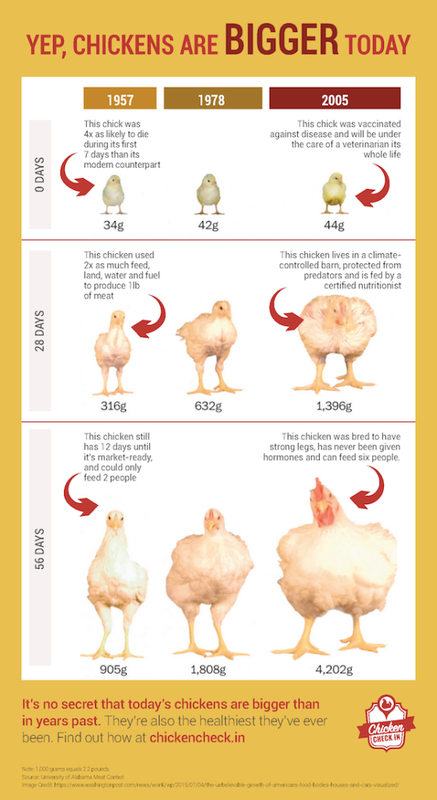 If you want to learn more about why chickens are bigger today than before, check out this infographic on chicken growth over time. To download a PDF of this FAQ on raising broiler chickens, click here.